We’ve also got inspiration for 9 wildly impressive summer appetizers, but if you don’t want to go quite so gourmet, you can never go wrong with an amazing guacamole recipe. This simple classic comes from Gaby of What’s Gaby Cooking, and considering she wrote the Absolutely Avocados Cookbooks…yeah, we’ll go with her. Bonus tip: If you have neighbors with very small children and toddlers who aren’t yet eating adult food, and you’re on food duty, set out a box of squeezable baby food packets or yogurts in a bucket on ice, or so those parents don’t have to run home to grab more baby snacks if they run out. 4. Let printable food tags do the explaining for you. If you’re going with a potluck, leave a stack of blank index cards along with Sharpies along the buffet table. Ask your neighbors to identify their dish and also write their name on the card. That way guests will know who to ask if they have allergy questions and also where to get the recipes for their favorites. 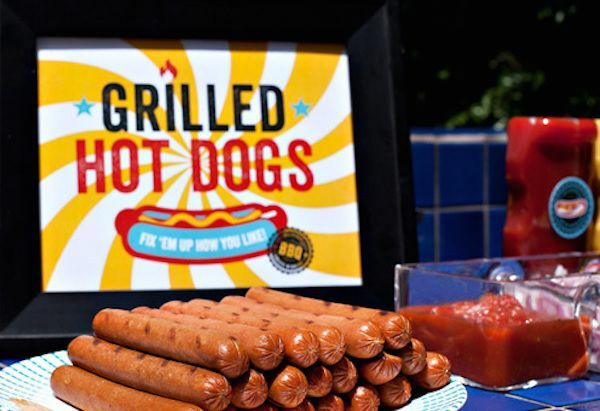 To get a little more fun, look for printable food labels like these printable grilling themed tags at Hostess with the Mostess. So cute! For grownups, activities are easy: Stand around with beers or sodas, and chat. But then there are those kids, who may need a little more to keep them entertained. 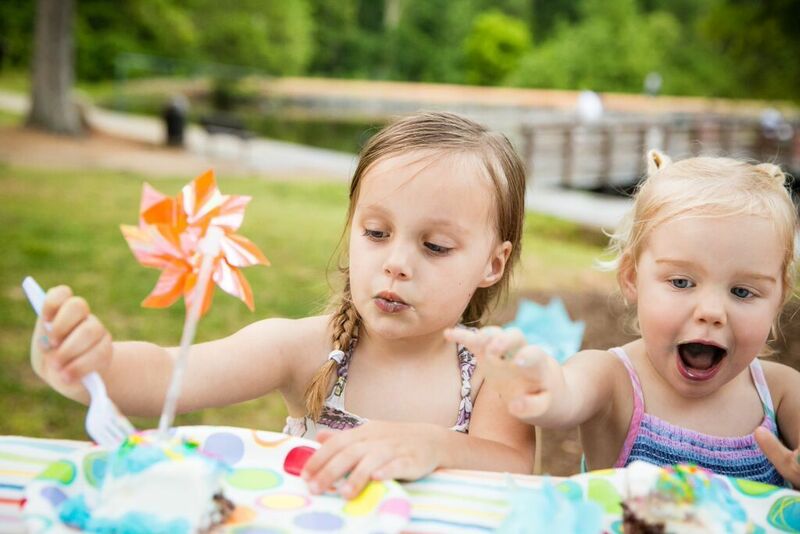 Our first rule when it comes to party games: Plan activities for kids that allow you to do the work ahead of time, then let them play on their own at the party (if they’re old enough, of course). That way you can enjoy visiting with your adult neighbors, not manning a kids’ zone. For the kids, you don’t have to get too crazy. There are smart ideas for 10 block party activities at Alpha Mom, like water balloon tosses, Silly String fights, and bike decorating leading up to a bike parade for all the adults. Click over from some really good ideas. 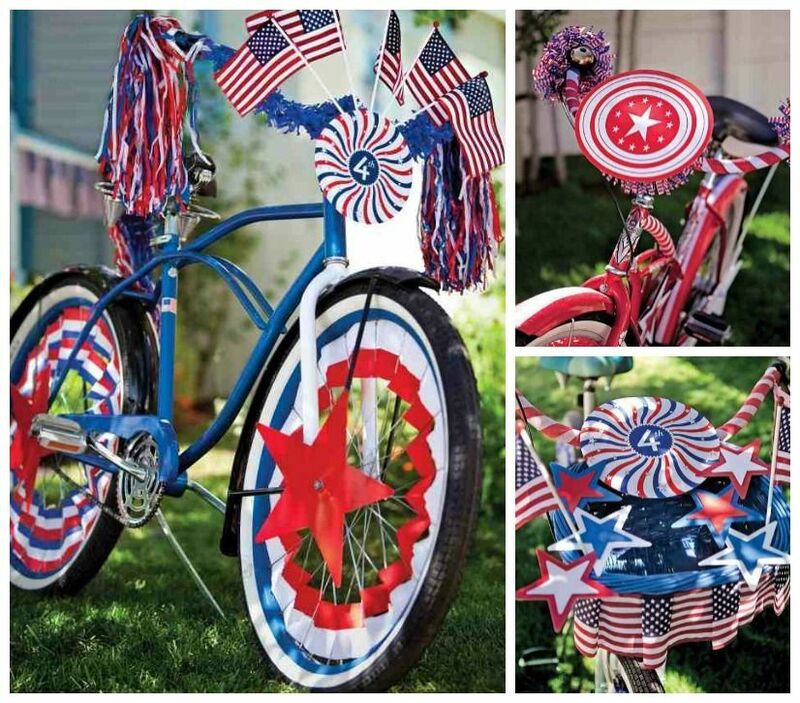 Martha Stewart also has some wonderful decorating ideas for a Fourth of July bike parade including printable pennants and spoke covers (above) that are super festive all summer. Or hey, just put out jump ropes, hula hoops, Super Soakers, and soccer balls. You can even include those kinds of things on the Signup Genius form to make sure there are enough to keep kids busy. For something with a little more effort, we think our kids — whether they’re riding tricycles, bicycles, or scooters — would go nuts over the drive through bike wash (shown above, from Momfluential) one end of the street. It definitely takes some work ahead of time, but once it’s built you can set it up and let kids play. Or, if lower key is your thing, bubbles are always a big hit, whether you get a party pack of small bottles the kids can run around, or make a huge person-sized bubble wand. 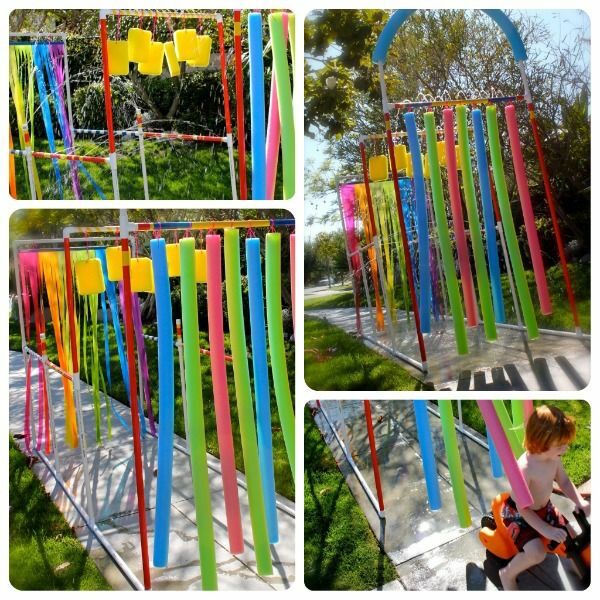 Visit One Charming party for all the instructions, and get ready for an awesome photo opp. And of course, there’s always sidewalk chalk. Imagination FTW! Don’t forget non-alcoholic beverages! No kidding, we’ve been to parties where there’s enough beer for miles and not a single glass of water to be found. And hanging out on the asphalt all afternoon in the hot summer sun means you really need to stay hydrated. Big plastic pitchers for water should be on the sign-up list, along with non-alcoholic punch, lemonade, iced tea, or soda, and make sure you have buckets full of ice; coolers will keep the ice cold longer than you think. 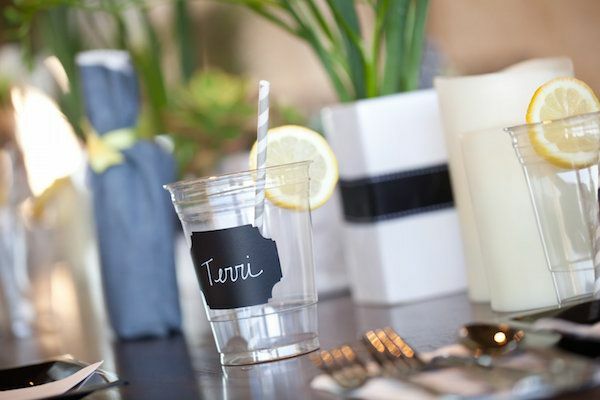 You can also save money on party supplies by getting your neighbors to label their cups with a sharpie, or adding cute chalkboard stickers for cups like these from Etsy’s Rodarte Lab. (You can also find them on our affiliate Amazon if the shop is closed) so you aren’t going though four or five cups a person. Plus, you can tease the guy who you catch leaving the 3/4-full cup of beer somewhere. There’s always one. You may want to think about bugs and other uninvited guests. 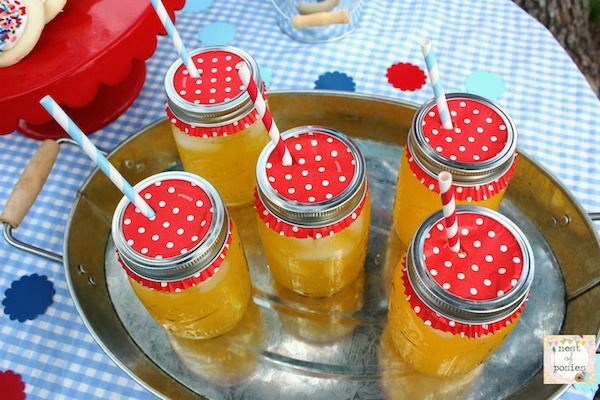 Poking a straw through a cute cupcake liner is a creative way to them of your drinks when you’re dining al fresco. But how clever is Nest of Posies’ idea to fasten the cupcake liners with mason jar lids so they don’t blow away? 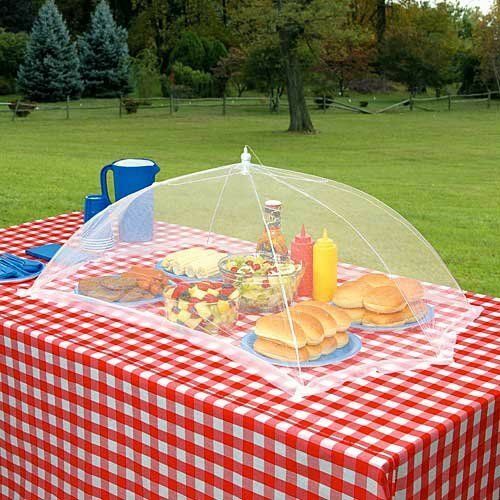 We’ve also seen lots of silicone food covers to keep bugs off the food, but our preference is still good old mesh picnic covers sized to fit a dish. You can also find giant food covers on Amazon (our affiliate) to protect half the table, like the one above. This way, can see what’s underneath, and it doesn’t heat up the food the way silicone or tin foil can. Because hot potato salad is never a good idea. 8. Serve ice cream cake sundaes! The perfect dessert on a warm summer night is ice cream, right? But no one wants to stand outside scooping for the entire block. Instead, we love the idea of grabbing a Carvel ice cream cake while you’re already at the grocery getting your other supplies. Here’s the bonus: If you leave cookies or other baked goods out all day, that’s fine, but you know the kids will get into them. This way, you can bring out the ice cream cake just when it’s time for dessert and keep a bit of a cap on sweet treats throughout the party. We also love the idea of slicing the cake, and serving in bowls along with a toppings bar. If it’s hot out, think about gummies, sprinkles, mini sugar cookies, wafers, berries, and non-chocolate candies. Everyone will get a delicious mix of cold ice cream, chewy brownie-like cake, and all the toppings they want. You’re going to be having so much fun, your kids will want to stay up playing after the sun goes down. Or, maybe you’re hosting a dinnertime party to begin with. 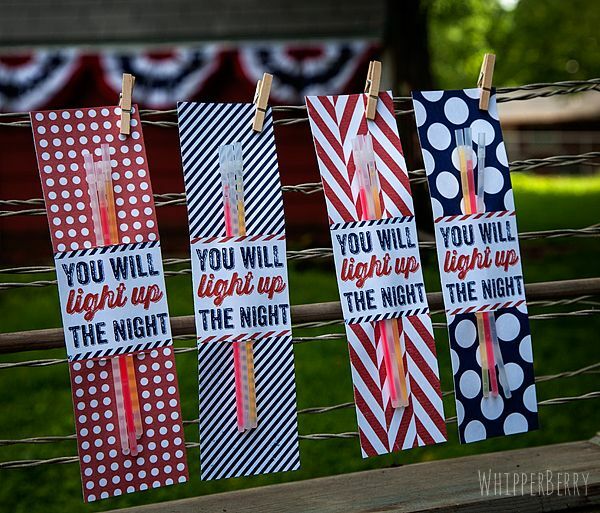 So make sure you can still see where the kids are by passing out glow sticks, with this cute free glow stick printable we found at WhipperBerry. Or just have a basket of cheap flashlights for the kids (and fun-loving grownups) for playing flashlight tag. And how much fun would it be to let all the neighborhood kids create their own cars for a “drive in” movie after dark? 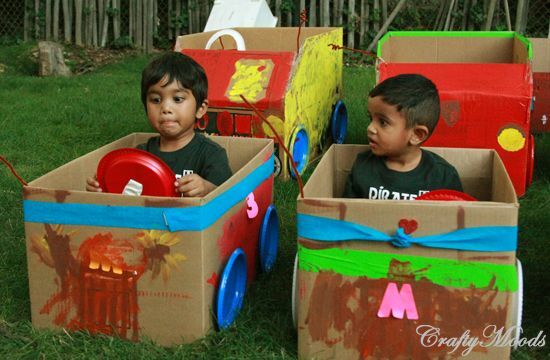 Crafty Moods has some great tips on how to make your toy cars out of cardboard boxes. We’d let the kids do the crafting and painting while it’s still light out, then set up a movie as a surprise when the sun goes down. They can climb in with their ice cream cake sundaes and chill out. The perfect ending to a perfect party. It’s so easy to stay busy making sure the party runs smoothly that you forget to take pictures of all the festivities. And if you do remember to capture the kids, remember to take time to take some pictures with you in them too! We promise you won’t regret it. Our editor Kristen has shared some great tips for taking selfies with your kids, so you don’t have to ask friends to play photographer all night long. 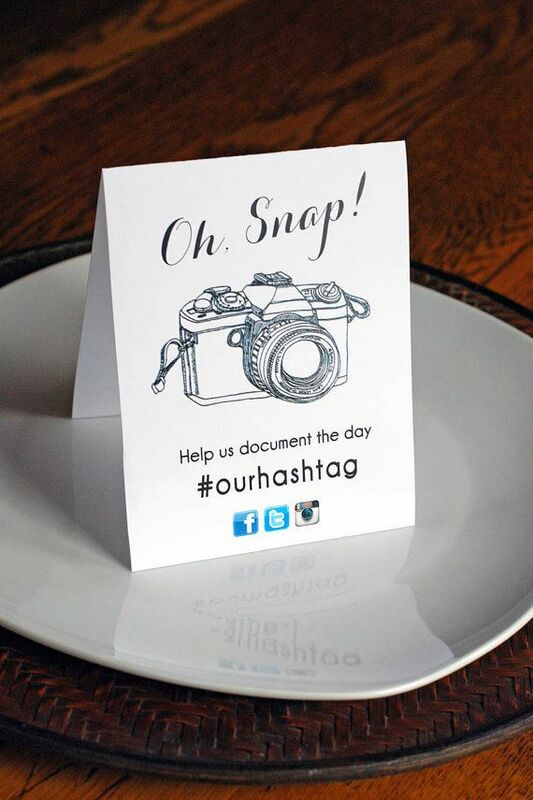 We adore seeing everyone else’s pictures from parties we attend too, so consider creating a hashtag and sharing it in your invitation so your neighbors can find each others’ pics more easily on Instagram or Facebook. 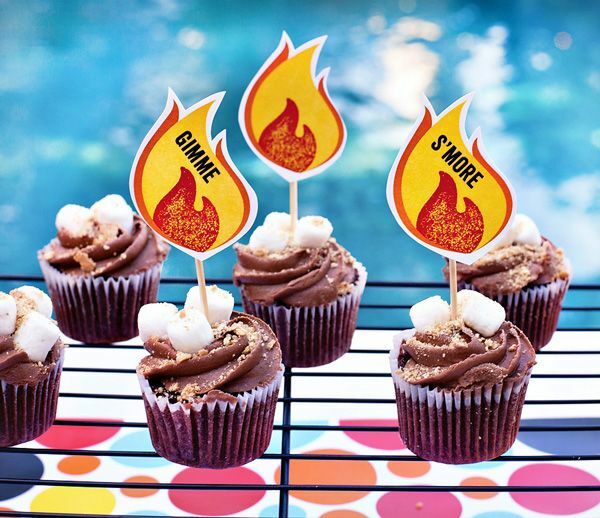 Create a banner with the info as part of your party decor, or download this printable social media sign from Ivory Isle Designs to set out on your food and drinks tables. Though we definitely suggest getting permission to post photos of other people’s kids on social media. Of course you can always create a private folder for everyone’s photos on a cloud site like Dropbox or Amazon Cloud Drive that everyone can contribute to. So easy — and you’ll have all those memories saved forever. Thanks so much to our seriously cool (in all senses) sponsor, Carvel and ILoveIceCreamCakes.com. As you’re planning your block parties this summer, be sure to check out our the site. You’ll find some pretty sweet coupons you can use at the grocery towards some of our favorite Carvel ice cream cakes. Because cake is great, but saving money on them is even better. These are all wonderful tips and ideas! Love the food covers – they would definitely be helpful when serving food outdoors. 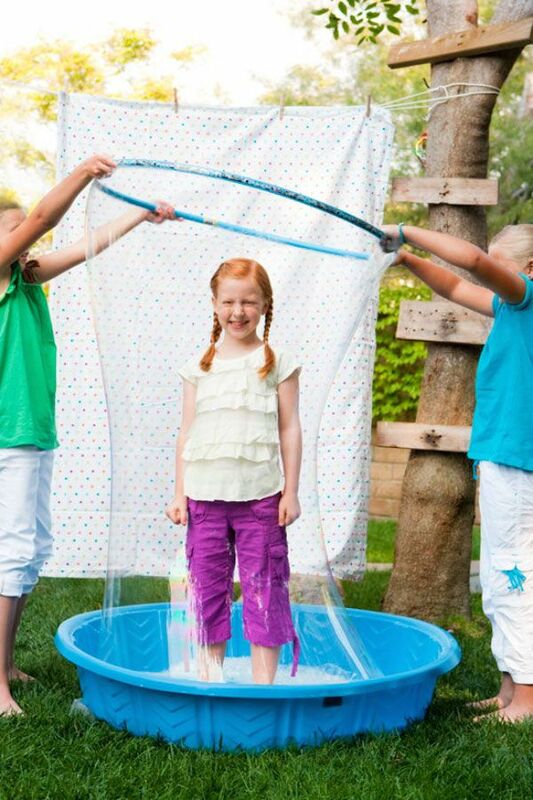 Thank you for sharing all these great tips that will make summer even more fun. Especially the food and drink covers are definitely something to remember.